With all due respect to the Florida Aquarium and its fellow aquariums around the world, looking at the marine exhibits through the giant floor-to-ceiling glass windows is pretty spectacular, but it in no way compares to actually being INSIDE those marine exhibits! Recently, Candace and I received that chance. The Florida Aquarium invited us to stop by and get up close and personal with some of their friendliest, and even more intimidating, feature attractions. We jumped at the opportunity, or, should we say, jumped in at the opportunity! Tomorrow we are going to give you a full overview of touring The Florida Aquarium, but today we are focusing on two awesome adventures. 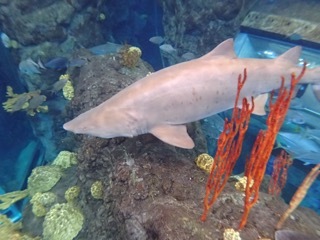 The Aquarium offers several special VIP experiences that afford guests the opportunity to check out their exhibits from unique perspectives. Being avid scuba divers, 3 of these experiences immediately caught our eyes: Swim with the Fishes, the Shark Swim, and the Dive with the Sharks. 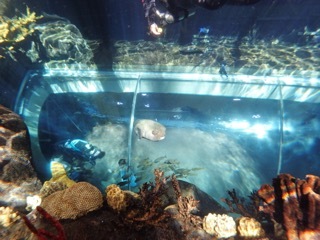 All of these experiences allow guests to actually enter the aquarium tanks and swim with the residents there. The Dive with the Sharks tour is only available to those guests who are scuba certified. 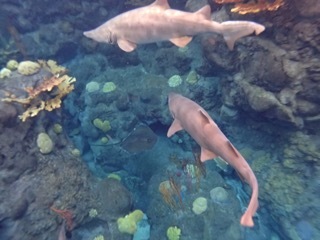 While we are both certified and love to dive, we decided to check out the Swim with the Fishes and the Shark Swim adventures so that we could share those experiences with all of our readers. Here is how it all went down! 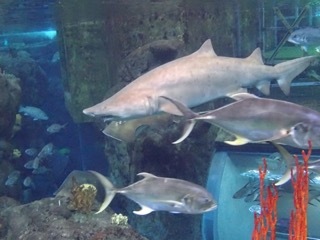 The adventure takes place at the Florida Aquarium, which is located in the heart of the Riverwalk complex in downtown Tampa, Florida. The Aquarium has its own parking lot right next door, so parking is simple. If you are lucky, you may catch a cruise ship getting ready to set sail! All 3 adventures include Aquarium admission, so make sure to leave plenty of extra time either before or after your adventure to check out the many exhibits throughout the Aquarium. We chose to tour the Aquarium before our adventure so that we would have an idea of the environment in which we would be swimming. The problem with this was, upon seeing adventurers already in the tank, we instantly grew so excited for our upcoming adventure that we had to force ourselves away from the tank’s viewing areas to go check out the remaining exhibits! You will be given a time for your adventure and you will go to the guest services desk in the main lobby, where you will be met by a program staffer. Ours just happened to be a transplanted Ohioan (we Buckeyes are EVERYwhere!). You will first be given an abbreviated behind-the-scenes tour, which we appreciated more because we had explored the Aquarium on our own, so we had our bearings and knew where we were in relation to the exhibits. You will then go outside onto the roof of the building where you will find changing rooms, lockers, and shower facilities. 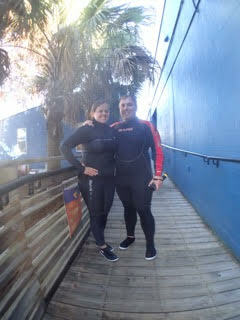 The staff already laid out wetsuits and booties for us so we could change and be ready for our adventure. Clad in our wetsuits, we made our way back into the main public area where we posed for pictures with the staff photographer and then made our way back up the roof to dive in. The main Aquarium is actually one large tank, divided into two distinct exhibit spaces by a submerged platforms surrounded by gates. We were met by our divemaster who was already in the waist deep water. We went down the steps into the water and he handed us our masks and snuba gear. If you have never gone snuba’ing before (no clue how to make that word a gerrand! 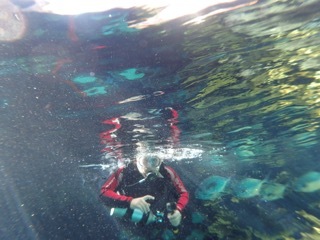 ), it is a cross between snorkelling and scuba diving. 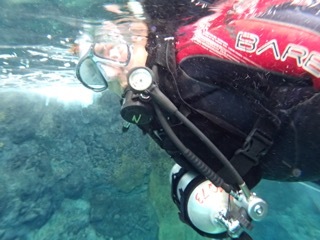 You will use a small compressed air tank (just like a scuba tank, only smaller), and a scuba regulator. It is attached to a smaller version of a BCD, which is a vest that fills with air. The tank and vest will be on your stomach, and thus underneath you, while you swim in the prone position. This keeps you on the surface of the water at all times. Since you will not be diving below the surface, you do NOT need to be scuba certified. The whole snuba setup essentially creates the easiest and most comfortable snorkelling experience you’ve ever known. In order to protect the environment inside the tank, adventurers are not permitted to use scuba fins (um, you may call them flippers). This means you will be propelling yourself by swimming with your arms. Do not worry, you are not swimming very far and there is zero current, so it really is an easy and relaxing swim. Ok, we geared up and were ready to swim with the fishies! Our adventure would be divided into 2 sections: the Swim with the Fishes first and then the Shark Swim. The platform where we geared up splits the tank in half, so we simply turned to our right and our divemaster opened the gate, allowing us to enter the coral reef environment. Look, as a certified diver, I have seen some pretty spectacular underwater environments. Since this adventure is open to most guests, including those who have never gone diving before, I can only imagine how mind blowingly awesome this entry into the environment must be. You are instantly enveloped by the gorgeous coral formations (yes, they are artificial, but are nonetheless beautiful) and active aquatic residents. You will spend the next 20 minutes forgetting about everything else in the world and just taking it all in. The fish do tend to keep their distance from you, but there is no better way to appreciate their beauty. From your vantage point, you can see the guests through the window glass. Some will wave to you (if they can take their eyes off of the fish that is) but, since your snuba gear keeps you on the surface, you really do not have much opportunity to interact with them. What do you next? Well, everything and nothing! There is no real purpose or agenda to this adventure other than to just experience it and take in all of the spectacular views. You can stay in one spot or slowly make your way around the tank, exploring the inhabitants from as many different angles as you can imagine. It really is something else, and is an enjoyable experience for guests of most ages. Our divemaster called us in as our time was up and we had to make our way back to the platform. If you are only signed up for the Swim with the Fishes, this where you will remove your gear and head out of the tank. Fortunately for us, we were also adventuring the Shark Swim! Once back on the platform, we never left the water. Instead we made our way to the gate that opened up to the other half of the tank. Our divemaster instructed us in the proper use of the shark wand. This was a long, yellow pole that Candace and I would each hold onto as our dive master steered us around the surface of the shark tank. Remember, we were not wearing fins, so he would be our sole source of propulsion as he advised us to sit back and enjoy the ride. 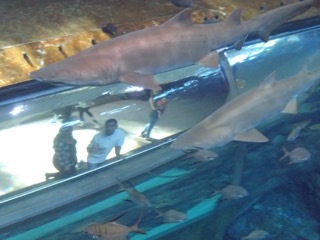 We entered the shark tank and were instantly blown away by the majesty of these gorgeous animals. Look, I know that many people are afraid of sharks (thanks Jaws! ), but they really are phenomenally graceful swimmers and a marvel to watch. The swim is done in a safe, controlled manner and I never even had a momentary thought of concern, let alone worry. Instead, I felt privileged to be in their presence. Attached to the shark wand controlled by our divemaster, we made our way around the surface of the tank and observed the sharks and the resident sea turtle. The tour is structured in such a way so that you really do not have to do anything, you really can just sit back, relax, and take it all in. Our time spent in the tank was very enjoyable and, well, getting that up close and personal with these gorgeous sharks is something you really cannot forget! I strongly encourage you to check out our 2 YouTube videos from this adventure as they will give you a great idea of what it is like to be in the tanks, and, frankly, the pictures do a much better job of conveying the beauty of these environments far better than I can! Alas, our time was up and we made our way back to the platform. I wanted to stay longer and was temped to make them force me out of the water, but I knew that was a battle I would lose! Needless to say, I enjoyed this adventure and I did not want it to end. Once back on the platform we removed our masks and snuba gear, then made our way up the steps and along the rooftop back to the changing areas, where fresh towels and hot showers awaited us. Once we changed, we bid our guides goodbye, thanked them for everything, and then made our way back to the lobby and went in search of some dinner. We were surprised how much of an appetite we worked up, and yes, we did have an enjoyable dinner of, what else? Fish! You can bring your own dive mask if you want. If you are a scuba diver or avid snorkeler and you have a mask that works for you, you may want to take advantage of this and bring your own. If not, just use the gear provided by the Aquarium, it is good quality gear and it is just easier to do so. Speaking of gear, I judge these adventures a lot by the quality of gear. I have been places that only stock tattered wetsuits and leaky masks, and, well, the condition of the gear is usually representative of the quality of the operation. The Aquarium provided quality wetsuits and gear and I was perfectly comfortable using them. I checked out the regulators, masks, and other gear, and was very pleased with their conditioning and maintenance, and give the entire operation high marks for this. For the price difference, if you are going to do do the Swim with the Fishes adventure, I would absolutely recommend upgrading to the Shark Swim as well. You get to double your time in the water and explore an entirely different environment in the process. Make sure to leave time to explore the Aquarium either before or after your adventure. It is built in the cost of your tour and should not be missed. You can bring your own camera into the tank with you, but it must have a strap and be attached to your body at all times. If you do not want to do this, the aquarium does make a photographer available to you throughout the adventure to take pictures from outside of the tank and your dive master will video it for you. Digital copies of these are available for purchase in the main lobby after your adventure and can be combined with other pictures you have taken while visiting the Aquarium that day. If you think you want to participate in these adventures, BOOK EARLY. So the tanks are not overcrowded, the Aquarium caps the numbers allowed in the water at any one time. Thus, the time slots fill up early. So, if you have a specific day and time in mind, you want to make sure you can book your desired time slow so you will not miss out. We scheduled later and had trouble finding a time that worked for our busy schedule while we were in town, and we are thankful to the team at the Florida Aquarium for working with us to make this happen. We are glad that we did not miss this opportunity. 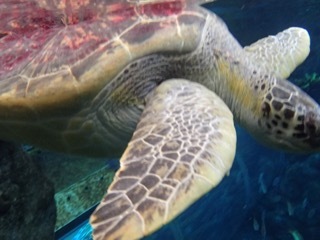 The behind-the-scenes adventures at the Florida Aquarium are definitely worth checking out on your next visit to Tampa. They make for a great gift, date or special occasion, or family bonding time. I am sure my nephews would have loved to have gotten in the water with us…maybe next time? The in-water time seemed short to me as it just flew by, but I honestly do not think that any amount of time would have been seemed “enough” to me as I could have spent hours in that tank. That being said, pairing this adventure with taking advantage of the free admission to tour the entire Florida Aquarium will allow you to fill several hours of a day of your vacation, so make sure you allow sufficient time to do so!